There are so many details to remember when planning your wedding. Table linens near Annapolis may not seem like an important item on your list, but this essential party rental can bring a lot of color and personality to your wedding. Depending on your personal decorating style, you will have a variety of options when renting table linens. Here is a brief guide to help you select linen rentals for your big day. Before choosing your table linens, you need to determine how many tables you will have, as well as the size and shape of the tables. Wedding linens come in many shapes and sizes, so make a complete list of every table you will have. You can do this by finalizing your guest list, finding out what table sizes will work best in your venue, and then selecting the right number of tables to seat all of your guests. Don’t forget to also include a table for your cake and any other food stations. Linens come in nearly every color you can imagine, no matter their size and shape. 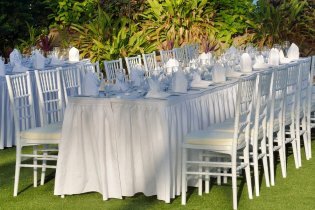 Decide how you wish to decorate your tables and chair rentals before finalizing the color linens you would like. 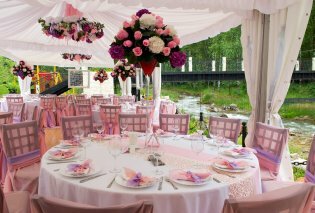 Depending on the season when you have your wedding, you may want to pair certain colors together through your linens. For example, in the spring, you may have a full-size table linen in ivory with a peach-colored table runner, and baby blue linens covering your chairs. There are a variety of ways you can use your linens to represent your wedding’s color scheme. Do not forget to consider the rest of your wedding decorations when selecting your table linens. For example, you may want to choose plain white table linens if you are designing a bright centerpiece or renting colorful dishes. If you prefer a simpler centerpiece, consider making your table linens brighter to offset the centerpiece. These two opposites will contrast beautifully. Rental equipment near Annapolis might include a tent rental for your wedding day. As you can see in this video, tents come in different styles and sizes. Speak with your party rental company about the various ways they can help with your big day. Your options in tent rentals include pole-supported tents, tensile tents, and frame tents. Depending on your need, and the location of your wedding, you may decide one tent is a better fit over another. For instance, frame tents are usually a good option for smaller events. Pole-supporting tents are suitable for larger events, but they require ropes and stakes surrounding the tent, as well as center poles holding up the tent in the middle. Consult your rental company to learn about the various tents, china, table linens, and other types of rental equipment they can offer. When you are searching for party rentals in Baltimore, you may come across different companies that will not offer you what you deserve or need. Speak with friends and family for recommendations of reliable companies. You can also go online and research the rental equipment catalog of various rental companies to see if they offer what you are looking for. Consider the following factors when you are calling a rental company to provide equipment for your special event. 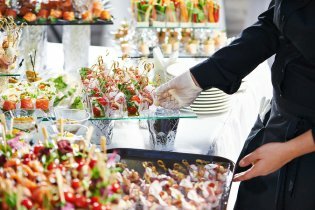 A good party rental company will have a lot of variety for you to choose from. From flatware and table linens to chair rentals and party equipment, you should have your pick of anything your party or wedding might need. Also, ask if the rental company has a showroom where you can drop in or make an appointment to see a preview of their inventory. Some rental companies do not offer setup and takedown services—in fact, some may not even offer delivery and pickup services. A lack of these services is not unheard of, but it is more common to see delivery and pickup included in your rental fees. Often, you will see an extra charge for the company to set up and take down any chair rentals and tables you have. Think hard about the event you are hosting and how helpful these extra services will be at the end of it. On top of a variety of equipment to rent, your rental company should be able to work with your budget. If you need chair rentals, there should be several different options, from high-end to inexpensive. Flatware, tables, linens, and decorations should also be available to fit your budget. Be upfront about your budget with your rental company, and examine your contract in depth. Make sure there are no hidden fees or missing services you should be getting. When deciding on a color, you may want to match the serving platter to the rest of the décor or stay neutral to provide a blank canvas for your table settings. You can pick a white, ivory, or silver platter to remain neutral. Look at the various china patterns you can choose from. Instead of a solid color or white platter, you can match your color scheme with accents of color on the serving platter. The serving platters should not look out of place with the rest of your china and rental equipment. Create a flawless look with matching colors, designs, and styles at your event.